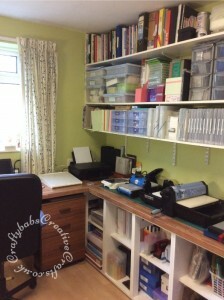 We’ve been busy at home with some pretty major revamping, part of which I’m delighted to say, included re-fitting my craft room. 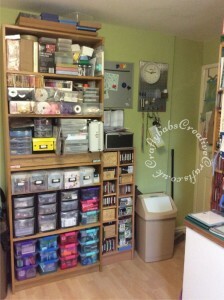 Like most crafters, my collection has evolved over the years, as has my storage. 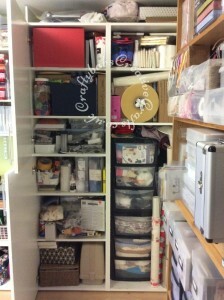 My long suffering hubby willingly put up shelves and modified an old wardrobe for me and I kept buying storage boxes etc. 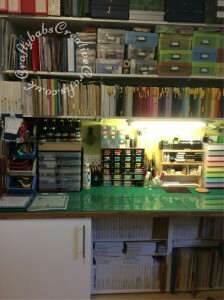 but it became difficult for me to work in the space that I had. 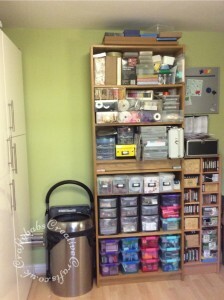 The most difficult part of the process for me, was finding places to put the mountain of supplies I had while we emptied the room and fitted the new ‘furniture’. My next problem was designing a layout that would give me the maximum amount of storage and, if possible, increase the area I had to work in. 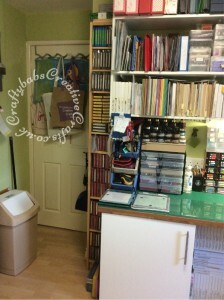 We used basic kitchen units and work tops bought from B&Q, most of which I chose to leave without doors to allow for easy access while crafting. 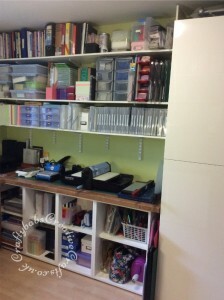 I chose to use deep wall units as base units (without legs) on two sides of the room which meant that I could craft at the worktops at desk height (crafting sitting down is a new experience for me now) and easily access supplied stored above and below. The work top is a continuous U shape which is great. 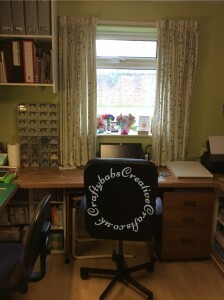 The designated ‘desk’ area under the window hides 2 additional tables that I can pull out when I need more work surface, and a useful set of desk drawers. The pictures below will give you a better idea of what I am talking about. I know it’s not as pristine & beautiful as the many examples you can see online but my room is quite small compared to most of them and it works for me. 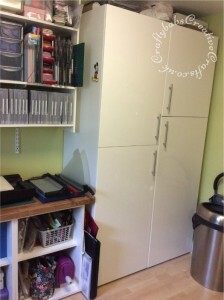 The large Cupboard unit with doors houses all of my Sewing, Jewellery making, Painting, Cross stitch, Glues, Christmas and other crafting supplies keeping them clean, dust free and easily accessible. 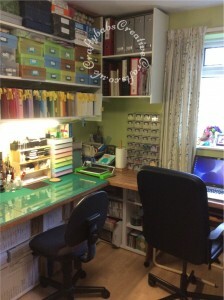 I just love that I now have designated areas for stamping, inking and colouring, word processing and computer work and die-cutting with all the relevent supplies easily on hand. To see the pictures full sized just click on each one. I am one very lucky cookie and have the best Hubby ever.